If you’re looking for a unique fun hike, the Lava Tubes are just what you need! As the name suggests, the cave was formed from actual lava! This is a super cool piece of history! The tubes are located right outside of Flagstaff, Arizona. The cave is open 24/7, so I would suggest going as early as possible to beat the crowd. The cave will be pitch black regardless of what time you go! The opening to the cave is just a quick walk from the parking lot. There are a couple of signs up that point you in the right direction so don’t worry about missing the entrance. It’s also near impossible to pass the cave since it’s a very obvious hole in the ground at the end of the path! The climb into the cave is the most challenging part of the entire hike. Once you make it past that, you totally got this! Make sure you have your flashlights ready, phone put away and your hands-free. Now into the black hole! Before you even start your descent into the cave you’re immediately greeted by a chilling breeze. Since the cave is so cold there are often ice patches on some of the rocks in the cooler seasons, so be careful on your way down. Also, don’t forget to be cautious of bumping your head on the ceiling above you, it can get pretty low in some places! Once you’re finally done climbing down, the trail evens out and turns into a pretty bumpy, but a level path. About a third of the time you will be climbing and hopping from rock to rock. It’s super fun! Eventually, you’ll come to a fork in the trail. Left is the easier choice… but right is where you get to test out your limbo skills! (If you choose to go right be prepared for the cave ceiling to drop down leaving you with only 2-3 feet standing room. People either awkwardly squat their way through or crawl for this section. It only lasts a couple seconds.) The two ways meet back up with each other within minutes. The hike is rated moderate for a reason. It’s pitch black and the rocks you walk over aren’t always steady. You most likely will be stumbling a good chunk of the way. So definitely think twice about bringing young kiddos down here. And definitely, DO NOT try to bring your dog down! 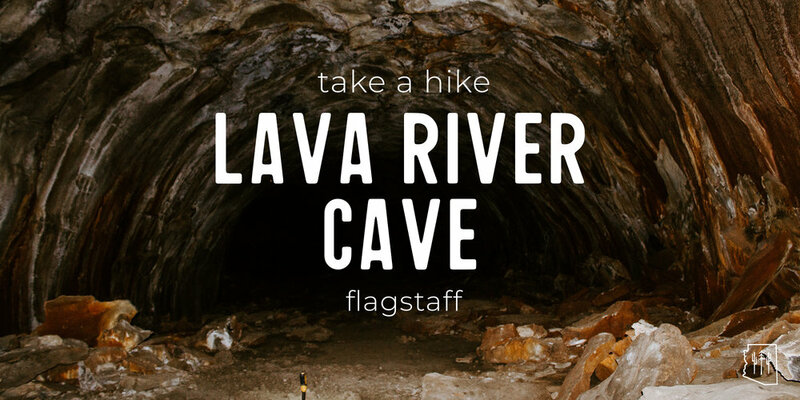 The Lava Tubes are located about 30-45 minutes outside of Flagstaff. Once you turn onto Forest Road 245 from Fort Valley Rd. you’ll take that for about 3 miles and then make a left onto Forest Road 171. Stay on that another mile and make one final left onto 171 B. There is a decent sized dirt parking lot at the end of the road. There is no parking fee. Once you’re off Fort Valley Rd. the rest of the drive is a maintained dirt road. In the winter the forest roads can be closed due to bad weather conditions. Bring at least 2-3 light sources per person. Headlamps are extremely useful and make sure you have a fresh set of batteries in your flashlights! Don’t forget to wear proper footwear! DO NOT deface the cave. Be respectful of it, as well as other hikers. There’s a lot of spots in the cave where you can hit your head so put on a hat/beanie for a little protection. We got along fine without them, but a lot of hikers wore gloves and were carrying walking sticks to help them out. If you are not a fan of caves, tight spaces, and the dark this might not be for you! If you wish to camp nearby, you must be 1 mile away from the mouth of the cave.